This 2018 Volkswagen Atlas will have you feeling like you're on top of the world. This luxurious full-size SUV is practical as much as it is functional and more than enough vehicle for your entire family. Seating 7 passengers comfortably, this Highline trim has a list of options that go on and on, such as navigation, bluetooth, heated AND cooling seats, heated steering wheel and rear seats, a gorgeous panoramic sunroof and manufacturer remote start (very handy during our Saskatchewan winter months). This Atlas will look after your family's safety with its 360 degree sensors, adaptive cruise control and blind spot detectors. This vehicle is like new. Zero accidents. 100% stunning. Rates as low as 0.9%. This is a MUST SEE, so don't waste anytime. Book a test drive today! 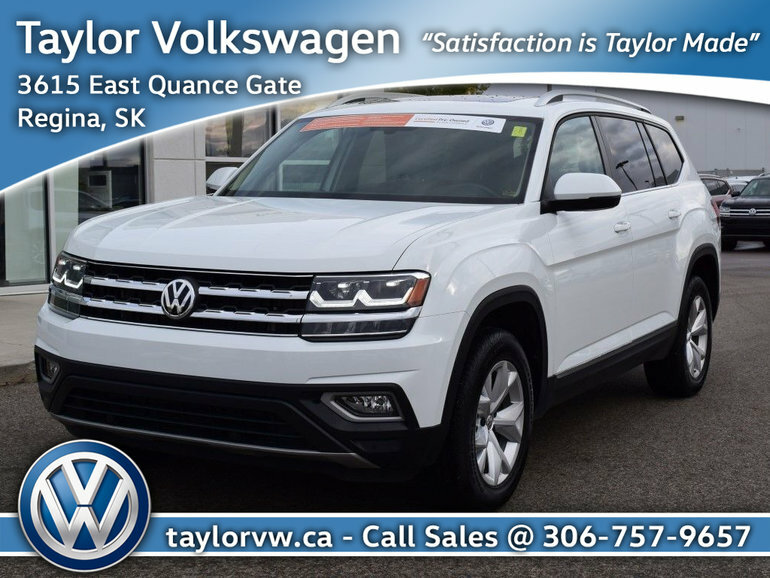 Interested by the 2018 Volkswagen Atlas Highline 3.6L 8sp at w/Tip 4MOTION January Sell Off !! Save $4000 !! ?